1. 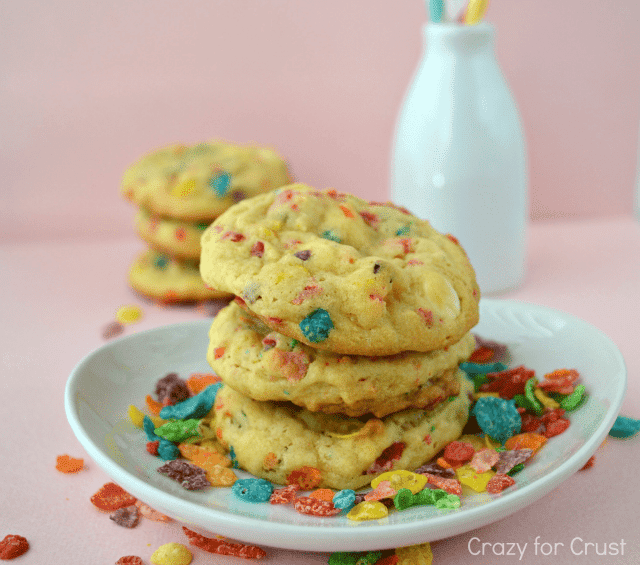 I made these cookies the other week, and I definitely need to make them again. They are so delicious and I totally forgot how enjoyable licking the batter is!!! 2. I've already told you about my new favorite website/app, Tweekaboo...BUT! I just ordered my first book of Ella's first month (I'm getting a book every month or 2 of all of the Facebook/Instagram/private photo stream pics I post) and it turned out sooooo great!!! Like Shutterfly quality, but I love how it also includes the date of each picture annndd people's comments from the Facebook pictures! 3. I decided to be crafty last week and attempt this past week and make this Easter egg garland I found on Pinterest. Well, it was a complete Pinterest fail. The water balloons would not inflate, the string got all tangled and wouldn't stick to the balloon at all...basically it was just one hot mess! So after that, I just ordered this paper garland off Etsy. Thank goodness for Etsy! 4. Here is the paper garland in action...as well as the rest of my Easter decor. I know, it's very over the top and ambitious of me. HA! I saw this idea on Pinterest, and unlike the disaster garland, this turned out totes adorbs if I do say so myself. It was pretty easy...the bunny ears were in the $1 section at Target, then I loaded up a basket (same one that we used in her newborn pics, that thing really gets around!) with some plastic eggs, and voila! Cute baby photo shoot! GAHHHHH! I can't even handle the cuteness!!! 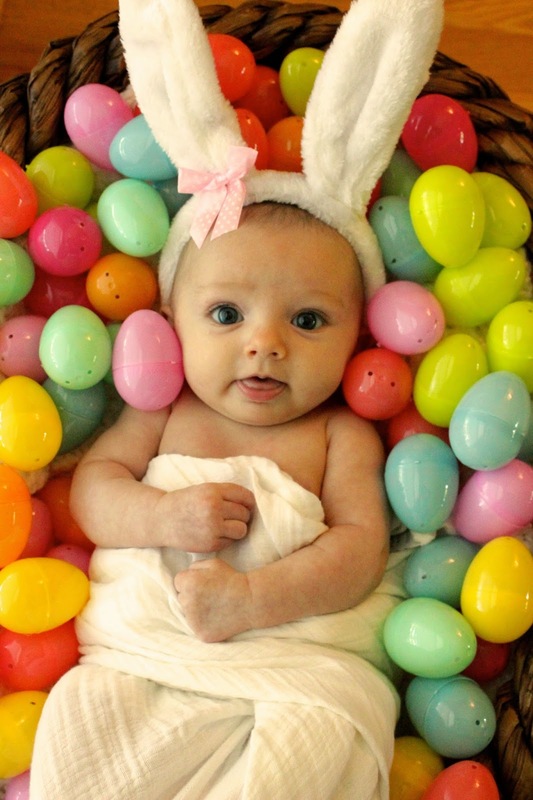 Your little Easter bunny is adorable! Cute idea. 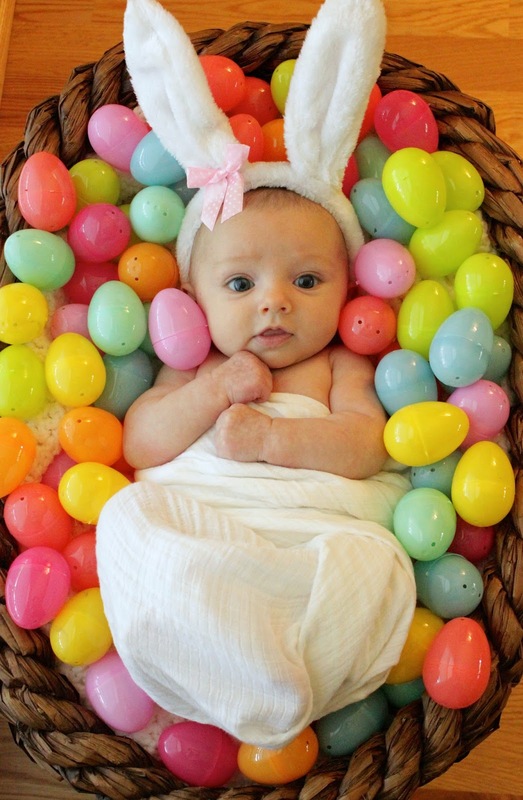 Oh my goodness...Ella's Easter basket photo shoot is the cutest! Your daughter is darling! And thanks for sharing that app, how awesome! 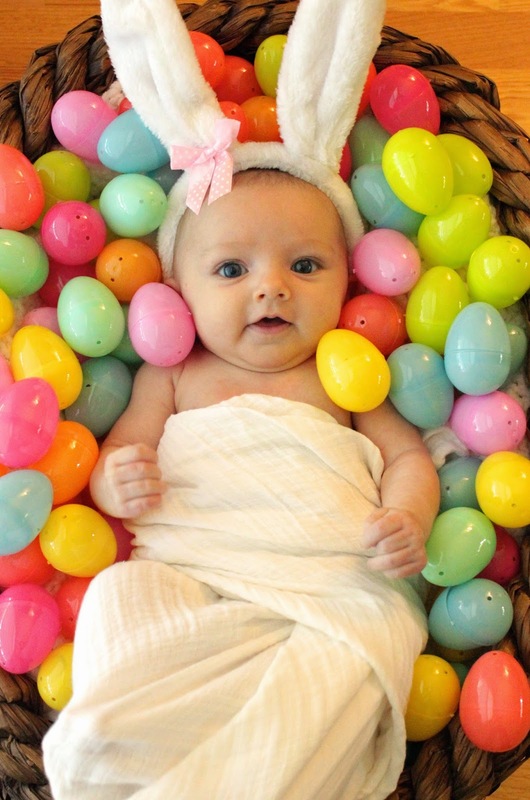 I never knew that existed (just in time for my second baby come July) Happy Easter weekend! Oh my, those pictures are too adorable! You have such a beautiful daughter! Saying hi from the linkup! You have a beautiful daughter! Love the idea of documenting her 1st year, even the facebook comments! So cool! What a cute little bunny! Happy Easter! I meant to comment on your post last Friday, but oh my goodness, I just love every single thing! You have the cutest little one! My 10 month old wouldn't leave his bunny ears on for more than 2 seconds at a time. And I love the photo book idea as well as those cookies. Yum!